In order to meet the expectations of users, we are excited to inform you that we will soon launch a new tube for Derma GeL® 100 mL. The new Derma GeL® 100ml tube was launched this month. We take this opportunity to thank users all over the world for their feedback and comments allowing us to pinpoint their needs. This new packaging has been created to exceed the expectations of users. During BETA 2013 in Birmingham (UK), we unveiled the new compact counter display for Derma GeL® retailers. 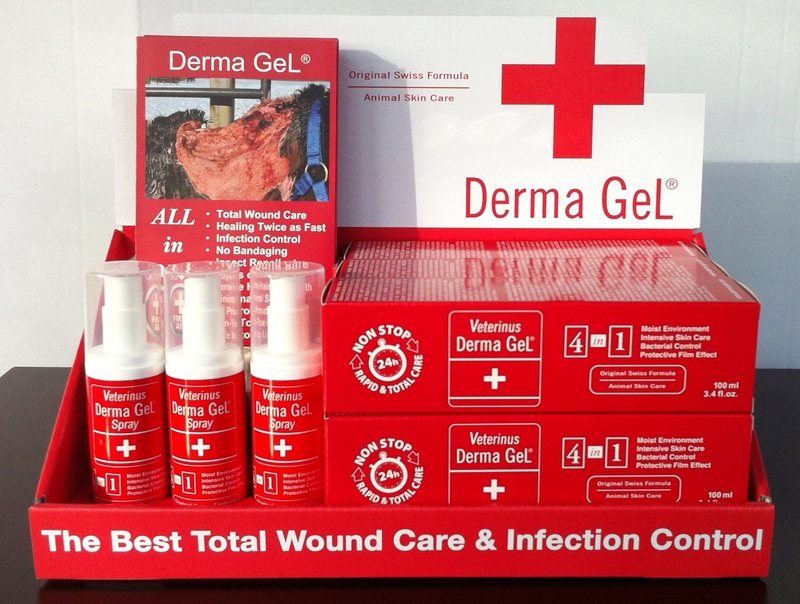 This attractive presentation containing products and educational literature is aimed to capture users attention - highlighting the undeniable superiority and leadership of Derma GeL® for wound care and infection control. For futher information within UK and Ireland, please contact Equine America UK Ltd. - Tel. 01403 255 809 or your local agent (contact details on www.equine-america.co.uk). For other geographical areas, contact us via sales@maxzenco.com. in addition to insect repellent features. Veterinus Derma GeL® Spray 50ml new packaging is launched. The new Derma GeL® tube 10mL (replacing the previous "pillow" tear-n-tuck doses), will be available as of March 2014. Packed per case of 60 tubes + 10 multilingual folded leaflets in ES / FR / GB. 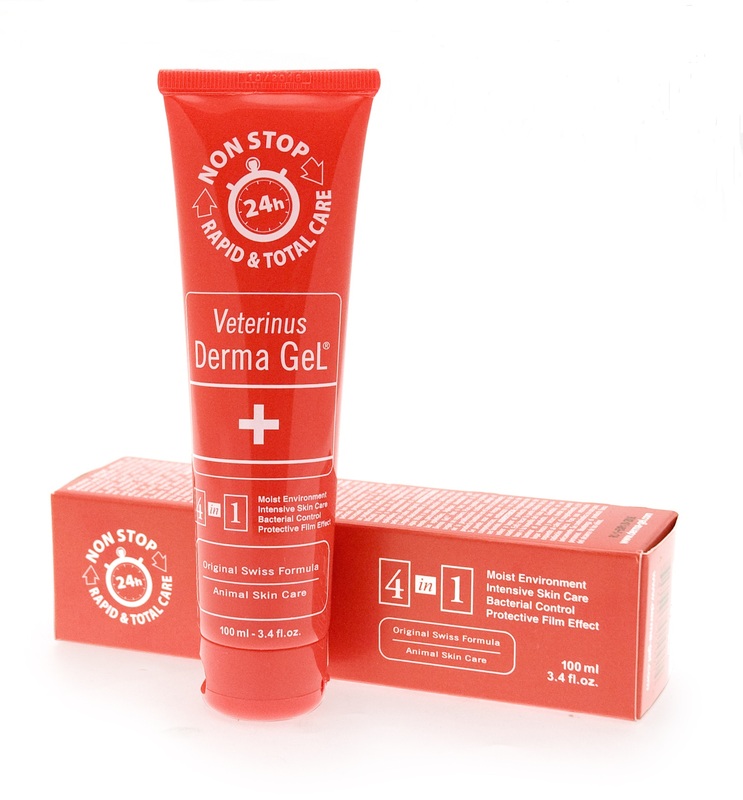 Veterinus Derma GeL® Tube 10mL has been upgraded with a handy flip-top cap (no need to unscrew the cap) which allows gel dispensing in a more precise manner. VasConTec Co., Ltd. is distributing Veterinus Derma GeL® products in South Korea. A new Veterinus Derma GeL® Spray 20ml - compact - is launched for very small pets and exotics. Pocket-size (slightly bigger than a credit card), this new spray meets the requirements and expectations of pet clinics, veterinary surgeons, nurses and end users. Veterinus Derma GeL® products are distributed in China, Hong Kong, Macau and Taiwan by AdVet (Beijing) Biotechnology Co., Ltd.
April 2017- Exhibition - AdVet (Beijing) Biotechnology Co., Ltd.
New box Veterinus Derma GeL "PAW CARE" containing 5 small tubes of 10mL - 0.34 fl.oz. This new item has been created to respond to users request of a smaller packaging targeting paw care.